I can’t believe it’s the end of September already! Many VAs have been saying to me that they’ve noticed a real uplift in the economy, with new enquiries and fresh projects being briefed every day – long may it continue. 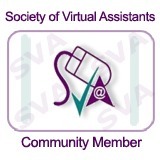 To help SVA remain top of the search engines, we rely heavily on incoming links from virtual assistants. We’d love it if you could display this logo and insert a link from your own website? Anyone who met Brad Burton at this year’s National VA Conference will know the vivacity that Brad brings to the room – and he’s injected a good dose of it into his book, which tracks his journey from daytime-telly-watching in his underpants to multi-millionaire. Is being a VA a real job? READ Becoming a VA – the Good, the Bad and the Useful!